Bismarck, ND — Earlier this month, a few dozen Native Americans showed up to protest the $3.8 billion, 1,172-mile-long pipeline that would cross right through their sacred land. As word spread, however, the few dozen turned into more than 4,000 native Americans. Because of the large turnout, a brief victory ensued for the people after the developers of the four-state oil pipeline agreed to halt construction of the Dakota Access Pipeline until after a federal hearing. Before the hearing started, however, North Dakota homeland security director Greg Wilz ordered the removal of state-owned trailers and water tanks from the protest encampment, despite the sweltering heat, because of alleged disorderly conduct. In spite of the government clamping down on them, the protesters remained vigilant. And, on Friday, they saw another victory. The Army Corps of Engineers confirmed that Energy Transfer Partners, the company constructing the Dakota Access Pipeline, does not have a written easement from the agency to build on Corps property, just north of the Standing Rock Sioux Reservation. “That’s true they don’t have the easement that’s required to install the segment that’s across the Oahe project,” said Larry Janis, Army Corps Of Engineers, according to KFYR. Now, the project seems to be in limbo as there is no current timetable on when the easement will be granted. However, the Corps has stated that they have issued a permission that will allow for the easement to be written. A review of court documents for the case currently unfolding in the U.S. District Court in Washington, D.C. has revealed that the tribal liaison for Energy Transfer Partners tasked with abiding by Section 106 passed through the revolving door and formerly worked for the Army Corps. The finding also raises key ethical questions in the field of archaeology. That liaison — Michelle Dippel — technically works for a Dakota Access LLC contractor named HDR, a company which helps pipeline companies and other oil and gas industry infrastructure companies secure permits for their projects. Dippel, the South Central Region Environmental Services Lead for HDR, began her career as a project manager for the Army Corps’ Fort Worth District and also formerly worked for the natural gas pipeline company Spectra Energy. “The Dakota Access pipeline was fast-tracked from Day 1 using the Nationwide Permit No. 12 process, which grants exemption from environmental reviews required by the Clean Water Act and the National Environmental Policy Act by treating the pipeline as a series of small construction sites. As news of insider deals and corruption spread, a number of protesters left the camp at Sacred Stone and descended on the law offices of Fredrikson and Byron — the firm representing the Dakota Access in court. Protesters demanded to know why the attorneys are representing the pipeline. “We’re here to protect the water. We’re here in prayer. The songs we’re singing were prayer songs. So we really wanted them to answer to some of the people. Some of the Standing Rock members specifically. Why would you want to threaten their lives and their water?” said Joye Braun one of the protesters. The Standing Rock Sioux Tribe has every reason to be furious about the construction of this pipeline, and their protest is undoubtedly just. The people of the Great Sioux Nation were betrayed by the United States government, who violated the nation-to-nation treaty by allowing permission of this pipeline before obtaining the tribe’s free, prior, and informed consent for its construction. The Standing Rock protest represents far more than a single pipeline. It is a stand against oppression that shows the people’s struggle for freedom. 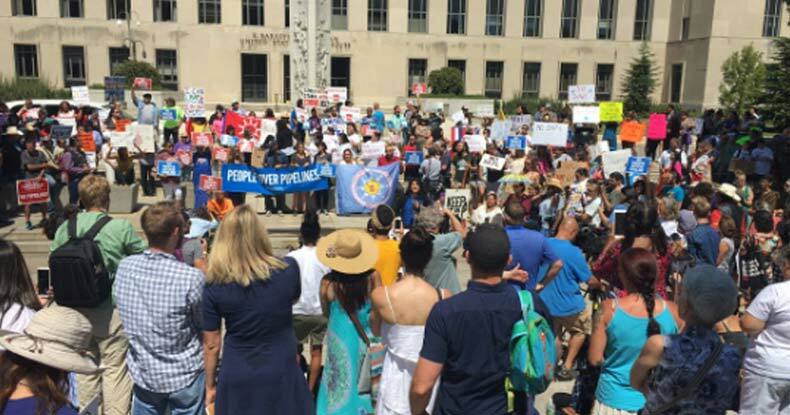 The fate of the pipeline now rests in the hands of a federal judge who will rule on the legality of the Dakota Access Pipeline on September 9. Will the people be victorious and protect their land and remain free? Or, will their history be rewritten once again, this time, with freedom defined as everything except big oil’s right of way?